Info "Hey! It’s Fronk! And he’s stuck on top of that building! Go save him!" Escape Artist is a Microgame in WarioWare: Smooth Moves. It is in Mona's stage. 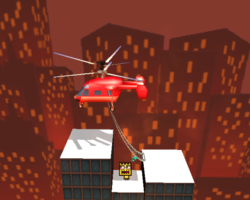 The player controls a helicopter with a rope ladder to evacuate a Fronk trapped between two buildings. 1st level difficulty: The buildings are small so the rope ladder can get to the Fronk faster. 2nd level difficulty: The buildings are a bit taller so it may take more time for the player to get the Fronk. 3rd level difficulty: The buildings are big and it will take lots of time to get the Fronk. This page was last edited on February 19, 2018, at 17:18.